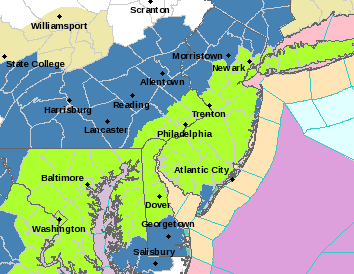 A blizzard watch has been issued for Ocean County for Saturday, an upgrade from a winter storm watch that had been issued yesterday. A high wind watch has also been issued, forecasting sustained winds of 30-40 m.p.h. Saturday with gusts between 50-60 m.p.h. A storm is considered a blizzard when, for three hours or more, “considerable” snowfall reduces visibility to less than a quarter-mile and winds are sustained at 35 m.p.h. or more. The blizzard watch calls for 6-14 inches of snow, with the amounts ranging from the low end on the coast to higher end the farther inland one is located. The NWS office in Mount Holly is calling for sleet to mix with the snow near the coast, reducing overall snowfall amounts. In a statement issued just before 11 a.m. Thursday, the NWS calls for snow to overspread New Jersey from south to north “primarily after the evening commute” on Friday, after 7 p.m. The storm will continue through Sunday morning, with the bulk of the snow falling during the day Saturday.